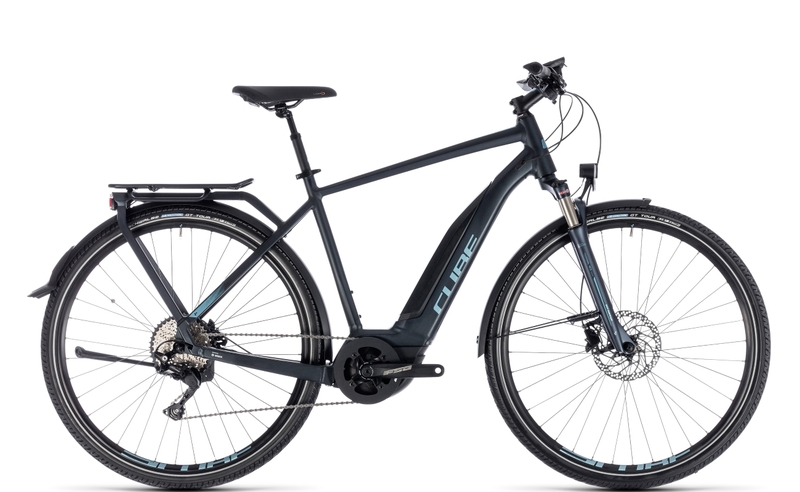 The Touring Hybrid Pro from CUBE utilises a semi-integrated frame battery on both crossbar and trapezium styles for sleek looks and clean lines. With stunningly powerful looks, this e-bike offers huge appeal to both ladies and gentlemen seeking a stylish touring bike. It’s simple design and sleek lines are immediately apparent. Combine these with Bosch’s new Active Plus motor and huge 500Wh battery, and the result is a fabulously enjoyable ride. The centrally located battery position on the down-tube is favoured by many and maintains a low centre of gravity. This results in a highly maneuverable and easy to ride e-bike. Equally at home in the city or on canal towpaths, long leisurely rides and touring are a joy wherever you need to be. No fuss and no frills, the Touring Hybrid Pro has powerful features. At the heart of the Touring Hybrid Pro is the brand new 2018 drive unit from Bosch, the Active Plus. This motor is the next generation Active drive and provides a smoother and quieter experience than its predecessor. Take off is progressive as is power delivery thanks to its 50Nm torque. The four levels of assist enable the rider to be in control at all times. A centrally mounted LCD shows all rider information clearly and concisely. The supporting 500Wh battery facilitates immense range and rides without the fear of exhaustion. Safety, comfort and range is what the Touring Hybrid Pro is all about. A set of gutsy puncture-resistant Schwalbe Marathon GT Tour Performance tyres with Dualguard guarantee confident, hassle free rides. No more fixing punctures by the roadside! The Shimano Deore 10-speed derailleur is smooth and forgiving. Gear changing is crisp, simple and effortless. Highly effective stopping power is provided via Shimano hydraulic disc brakes on a set of 180mm/160mm rotors. They’re progressive when required and ultra responsive. Comfort and convenience on the Touring Hybrid Pro are in plentiful supply. A fine set of SR Suntour NCX Air forks take care of every bump and nuance. A suspended seat-post provides super comfort. SKS Stingray mudguards and strong lights ensure safety and cleanliness whilst an integrated carrier allows the easy addition of Ortlieb luggage without any fuss. The Touring Hybrid Pro is perfect for long and relaxed rides.